Biting pests, fleas and ticks feed on the blood of humans, domestic animals, and other warm-blooded animals that cross their path. They can cause discomfort for people and animals with their bites, and worse, they can expose your family (including your four-legged family members) to serious disease and health concerns. Because they are a problem both indoors and out, fleas are a year-round problem and are capable of transmitting tapeworm, cat scratch disease. While rare, they may also carry more serious diseases like murine typhus. Flea bites can also lead to iron deficiency anemia and flea allergy dermatitis. In Oklahoma, blacklegged deer ticks and American dog ticks are a common problem in yards during the warmer months and may end up inside. More of a health threat than fleas, there are several tick-borne diseases to be aware of in our region including Rocky Mountain Spotted Fever, Tularemia, and Ehrlichiosis. According to Oklahoma State Department of Health, Lyme disease is also present though only a small percentage of deer ticks have been found infected with the debilitating disease. Not only a health threat, fleas and ticks can adversely affect your quality of life and drive you indoors when you should be enjoying your yard. Protect your family and pets, and take back your property with help from Montgomery Exterminating’s flea and tick control! At Montgomery Exterminating, we provide flea and tick treatments that effectively eliminate fleas inside your home and both fleas and ticks that have infested your yard and property. We’ll start with a thorough inspection to evaluate the severity of the infestation(s) and looking for any other animals such as rodents or wildlife that might be a potential food source for fleas and ticks in or around your home. Inside, we’ll treat affected areas to kill any fleas that have taken up residence. We’ll also treat the outside using products that eliminate adult fleas and interfere with their normal development into the adult stage. We’ll focus our tick treatments on shrubs, fence lines, tall grass, and other areas where these biting pests tend to lurk, waiting for a host to wander by. 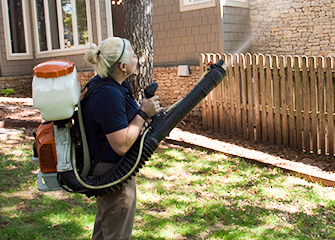 Did you know Montgomery Exterminating offers homeowners pest control program that not only controls fleas and ticks but other outdoor pests? Don’t let bugs… well bug you while you’re spending time out on the patio, by the pool or enjoying your outdoor living space. Learn more about this program below!